Today’s Illustrated Women in History is a written submission by James Purvis. 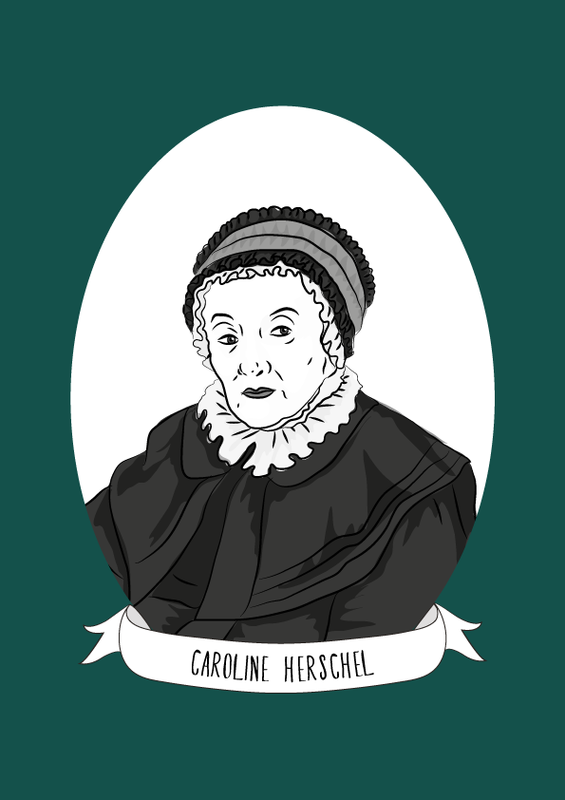 Caroline Herschel was an astronomer and singer, and was the first woman to be paid for her contribution to science. At the age of 22 Herschel, who had received training in music against the wishes of her mother, left her home in Hanover to join her brother William, who had established himself as an Organist in Bath, England. Herschel soon distinguished herself by becoming the principal singer in her brother’s Oratorio concerts, and received offers to perform across the country. Alongside his musical career, William Herschel’s interest in astronomy grew, and with the assistance of Herschel he was eventually offered the position of court astronomer to King George III. At this time, Herschel chose to leave her singing career and become her brother’s scientific assistant, although some of her later writings suggest that this was perhaps not an easy decision. Her skill as an astronomer was formidable, and in her obituary, the Royal Astronomical Society praised her ‘indefatigable zeal, diligence and singular accuracy of calculation’ as being significant contributors to her brother’s astronomical success. Herschel was awarded a salary by the court as an assistant astronomer, becoming the first woman to be paid as a scientist. Her work included the grinding of mirrors for reflecting telescopes, taking observations of stretches of the sky, and detailing the precise timings and positions of the observed astronomical objects, as well as a great deal of calculation in order to translate these times and positions into usable data. Between the assistance that she rendered to her brother’s work, Herschel found time for her own research, discovering a number of comets, as well as previously unobserved nebulae and star clusters, and compiling catalogues of the stars. Herschel was awarded the Gold Medal of the Royal Astronomical Society, and was later made an honorary member. Today, she is commemorated by a crater on the moon which is named after her. If you would like to submit a biography of a woman in history to be illustrated and featured, please send me a message!